Offering you a complete choice of products which include suggestion box for offices, powder coated mail box and stainless steel mail box. 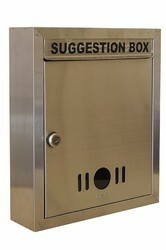 We are offering a wide range of Suggestion Box for Offices to our clients. Offered products are highly recognized in the market for their superior finishing and superior quality. Size: 11" x 12.5" x 3"
We are fervently engaged in providing an exclusive collection of Powder Coated Letter Box. In order to satisfy our clients, our experts only use finest technology & best in quality products as per the market prevalent norms. Moreover, this letter box is provided in different sizes & other related stipulations at market rates. By keeping in mind varied terms of our esteemed clients spread all over the country, we are offering an excellent range of Stainless Steel Letter Box. Owing to our quality range, our offered letter box has strong design & widely used in residential areas. Moreover, we examine this letter box on different quality measures in order to dispatch perfect range. 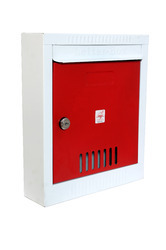 Also, we provide this letter box to our customers with unique designs at affordable rates.